Allen Toussaint left today, closed the door, now it’s time for you to open the door to his music because he is vital and shaped something special that a lot of the Rock world seems to have missed. His most well known song from outside the genre is Working In The Coal Mine. It was a hit in 1966 for Lee Dorsey, reaching No.8 on the US charts (you probably know Devo’s version). But it wasn’t just as a songwriter that he shone, he was also an influential producer, with two of my favourites on his résumé – The Meters and Dr John. He was also a talented pianist and an R&B giant that defined New Orleans. Here’s a song from his 1975 album Southern Nights sounding like it might have been on John Lennon’s playlist and sung through a weird effect. It’s Oriental, Psychedelic Swamp – now there’s a genre you’ve never heard. Watch the documentary below. 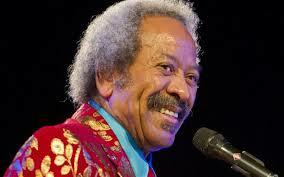 Toussaint died on Tuesday of a heart attack at the age of 77 after playing a show in Madrid. Rest in Peace, condolences to friends and family.